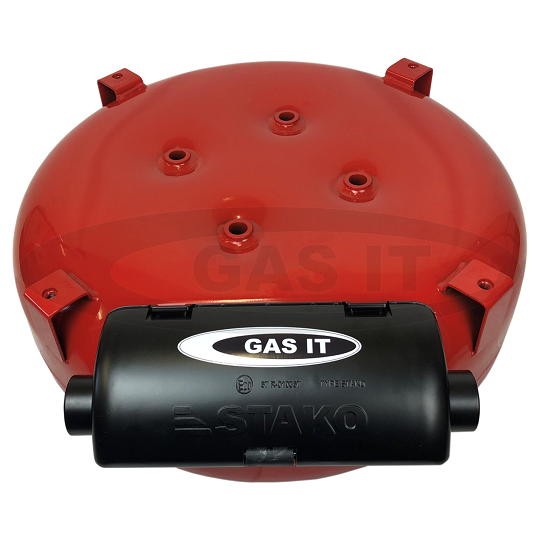 GAS IT Spare Wheel shaped Vapour tank off gas tank for Motorhomes, Caravans, Catering and many more - GAS IT Leisure Gas Bottles, Gas Cylincers and Gas Tanks - Catering, Motorhome, Campervan, Caravan, Farrier and Road Repair Refillable Gas Solutions. At GAS IT we constantly strive to design and introduce innovative products that are safe, functional and fit a requirement of our customers. Our very unique GAS IT EASYFIT Spare Wheel Shaped 4 hole gas tanks are designed and built to the same safety and regulation specification as our OEM products with built in safety not seen in other similar products. All GAS IT EASYFIT© gas tanks come with our unique, quick and easy to install mounting feet and with a Electric Remote Outlet or Manual Tap Outlet Option ( Listed in separate categories selectable below ) . All GAS IT tanks including our ground-breaking spare wheel shaped tanks come pre-fitted with all the gas valves and aluminium airbox, at no extra cost. Our full GAS IT product range is designed to be UK and EU compliant and are fully homologated so you know your safe GAS IT products are also approved and insurance friendly. Electronically Operated GAS IT Tank.